With the Red Line off the table, there is not a single new rail line in the next six year transportation plan (CTP) for the Baltimore region, in fact, no transit expansion at all. A new regional transit plan is now mandated by the legislature and may change that (work on it will begin soon), in the meantime it is obvious that the best thing to do in the immediate short-term is to make best use of the rail systems we have. Arguably that is not happening. This article is about the rail service with the maybe largest untapped potential. 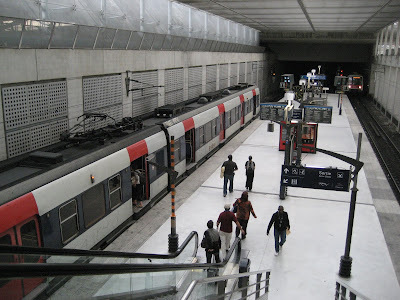 It operates on existing long distance or freight tracks and serves several city centers but it also has stations in the suburbs. It connects to Amtrak, light rail buses. Large parcels of land surround its stations. It has siblings all across the United States and which were, with two exceptions, all born in one single decade, the 1980s. 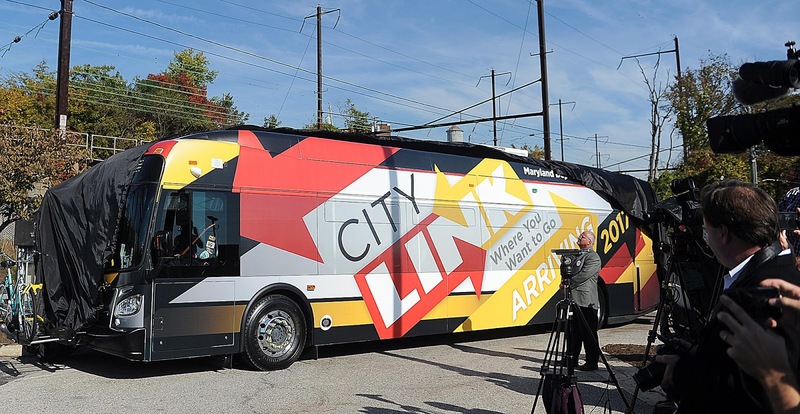 The Maryland version ranks #9 in the nation by ridership in spite of the state's small size and large rural sections. It is operating speeds of up to over 100mph to be increased to 125mph, making it reportedly the fastest of its kind in the country. 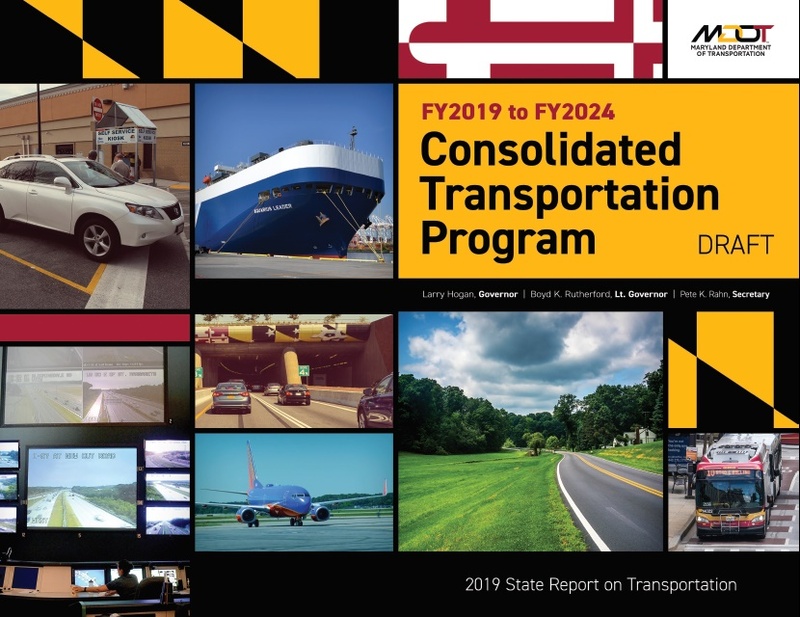 We are talking about commuter rail, of course, known in Maryland as MARC, a system that uses Amtrak and CSX tracks, and is managed by the same entity which runs Baltimore's buses, light rail and metro, the Maryland Transit Administration. The current administration has come to call the system a "virtual railroad" since it neither owns the tracks nor employs the engineers and conductors which run it nor conducts its daily operations, even though its music plays on the platforms. Born in 1984, the system has grown to the current level of service where it is 200 miles long and has 42 stations and slightly less tahn 40,000 riders a day. (Ridership fell recently). It operates 3 routes and dispatches 96 trains a day. Only the system serving the New York, Chicago, Philadelphia, Boston and LA metro areas predictably beat MARC in track length and riders. 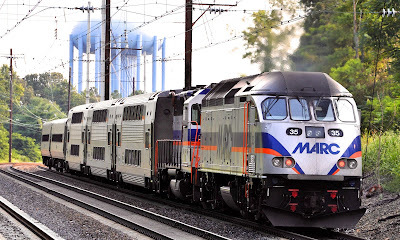 MARC reaches far out to Perryville in the north, and Martinsburg and Frederick in the northwest but chiefly connects Baltimore with Washington on two alternative routes, the Penn and the Camden lines. Until recently, MARC was the darling among the MTA modes, its trains ran reliably, tickets were cheap and service was expanded to run all day, later into the evening and also on weekends. Lately, the service suffered from many disruptions which left riders furious. 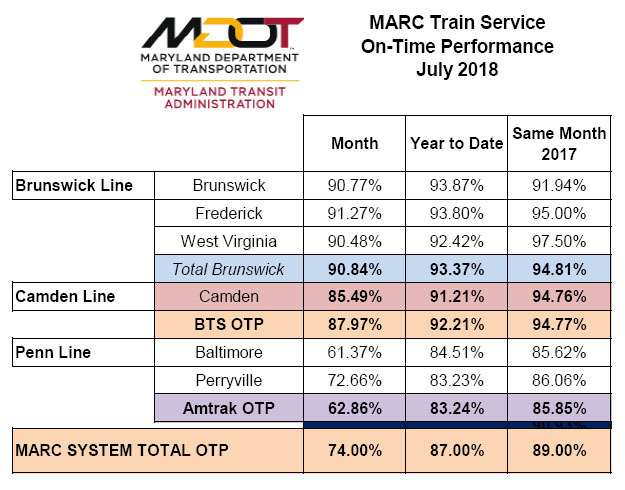 (MARC delays were 'awful' this summer. There's been some improvement, but problems still linger. Baltimore SUN, Oct 4, 2018) Many of the delays come from (Amtrak) track work and insufficient drainage which became obvious due to the heavy rains. There are also about a dozen trains per month failing due to mechanical or equipment failures. This article addresses untapped potential of MARC beyond the problems of this summer. The obvious question is, how could MARC be more? This question occurred also to Maryland's transit officials, at least back in 2009 when they prepared a long range plan and in 2013 when it was updated, both happened before the current administration came into office. This begs the additional question, what does the Rahn-Hogan team think about the MARC plan they inherited and are they willing to follow through with the suggested investments? The first phase of the plan envisioned a new Halethorpe Station, an expansion of the West Baltimore Parking lot, procurement of 54 MARC IV multi-level railcars to replace old coaches plus increase number of seats for $180 million, procurement of 10 new diesel locomotives to replace electric locomotives for $40 million, and the overhaul of 63 MARC III railcars for $34 million. 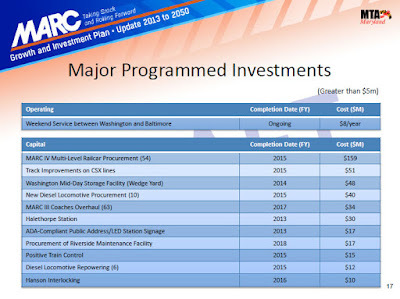 Rahn's MDOT notes that most of these projects were accomplished, including MARC IV Railcars, new SC-44 “Charger” locomotives, the construction of a Wedge Yard (midday layover for Brunswick Line), positive train control, plus new real time arrival signs, public address systems, ticket vending machines (Summer 2018) and mobile ticketing (Summer 2018). Still, the bulk of those investments goes back to decisions of the old administration and their funding plans. Many smaller steps were added. 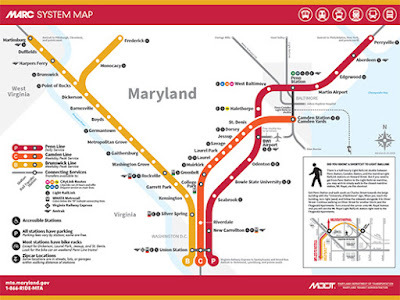 Two larger MARC improvements that were previously planned for a time after 2019 were moved up: new station facilities at Camden and BWI Stations. Dropped from the plans of the previous administration was a new Bayview Station and a modified West Baltimore Station, originally designed as intermodal stations with connections to the Red Line. Also dropped a MARC maintenance facility. After the Red Line has been cancelled, officials don't see any longer the need for a Bayview MARC station or a better West Baltimore MARC station, a problematic stand as we shall see. Improvements not yet in place, but listed in the long range plan for the time after 2020, include shorter headways in the peak hours, shortening headways during off peak to 30 minutes and the insertion of express service. More trains lead to capacity issues thanks to shared tracks. An important element of the future plans is, therefore, an additional track which would allow separating the fast Amtrak trains from the slower MARC trains (two tracks each, for a total of four on the Penn Line) and a Washington terminal expansion. A third track on parts of the Brunswick line would untangle MARC service from freight service. Also needed is the replacement of the two track Baltimore tunnel known as the B&P tunnel, a costly part of Amtrak's plans for the Northeast corridor from which Amtrak and MARC would greatly benefit. 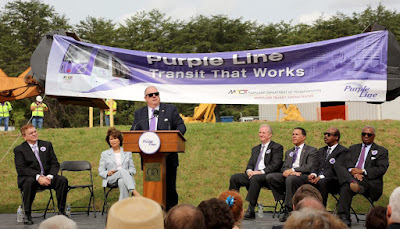 In total the long range plan assumed MARC investments totaling $2.35 billion by 2050, about the initial cost of the new Purple Line light rail line. (The B&P tunnel is estimated to cost $4.5 billion, cost not currently in any budget). None of those essential capacity enhancing items are funded in the CTP. The MARC long range plan (there are no such plans for Metro or LRT, in spite of earlier promises by MTA to get those prepared) looks like an excellent document in the transit diaspora we have now. But even those documents from a much more transit friendly administration lack the excitement of a well defined vision. 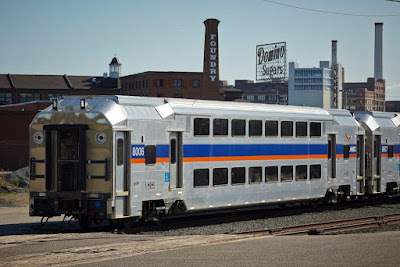 A real vision would elevate the service from being a stepchild of Amtrak and CSX to the status of a premier interurban form of 21st century transit. Sorely missing is also what is natural to maturing transit systems, the transformation from a park and ride transit system to one that fosters development at it stations. If Maryland won't get any new rail transit, it should get at least new development at existing rail stations. The reality is quite different: Except for some rather tepid transit oriented development at Odenton and a few bolder attempts at New Carrolton, MARC train stations are surrounded by a sea of parking (or nothing at all). The problem is common for US commuter rail systems. Studies show that for each rider taking up one parking space transit could get four more riders if the parking space were converted to TOD. It isn't easy to find stellar commuter rail systems applicable to our conditions, especially in the US where passenger rail always takes second place behind freight. Additionally, definitions are fluid. What is metro or subway, what light rail, what commuter rail, what intercity high speed rail? All these modes serve large metro areas and they often overlap in the way they provide service just like one can reach Washington from Baltimore via Metroliner, Acela and MARC. To see how beefed up commuter rail transit could look, one has to go New York or abroad: Paris, Sidney, Shanghai or Munich. The best commuter systems seem to be the ones which operate in the center similar to an advanced metro or light rail but become more like a railroad in the periphery. The noted cities are examples for this approach. In my hometown of Stuttgart (and many other large German cities) commuter trains (S trains) have been operated by the German Rail system for decades much in the same way as US commuter trains, i.e. as an overlay of service on the long distance rail system. Starting in the 1970s, several metro S systems were expanded beyond the traditional tracks to move underground in high density urban cores. 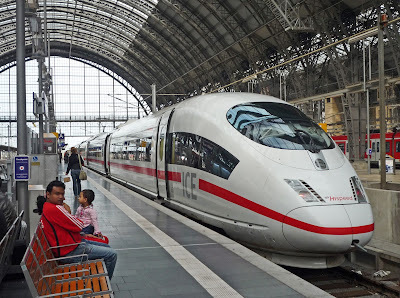 In the case of Stuttgart, S trains tunneled underneath the dead-end train station, traverse downtown with several stops and reconnect with the circumferential main lines on the other side of town. How would an ambitious MARC system look? It isn't to be expected that MARC would tunnel anytime soon under Washington, even though, Washington's Metro could certainly use some relief. But a more seamless service integration with Virginia's VRE commuter system should be possible, since both already serve Union Station (Through running trains). To the north MARC service could be extended to connect to SEPTA commuter trains, making the entire corridor from NYC to Virginia commuter rail territory. 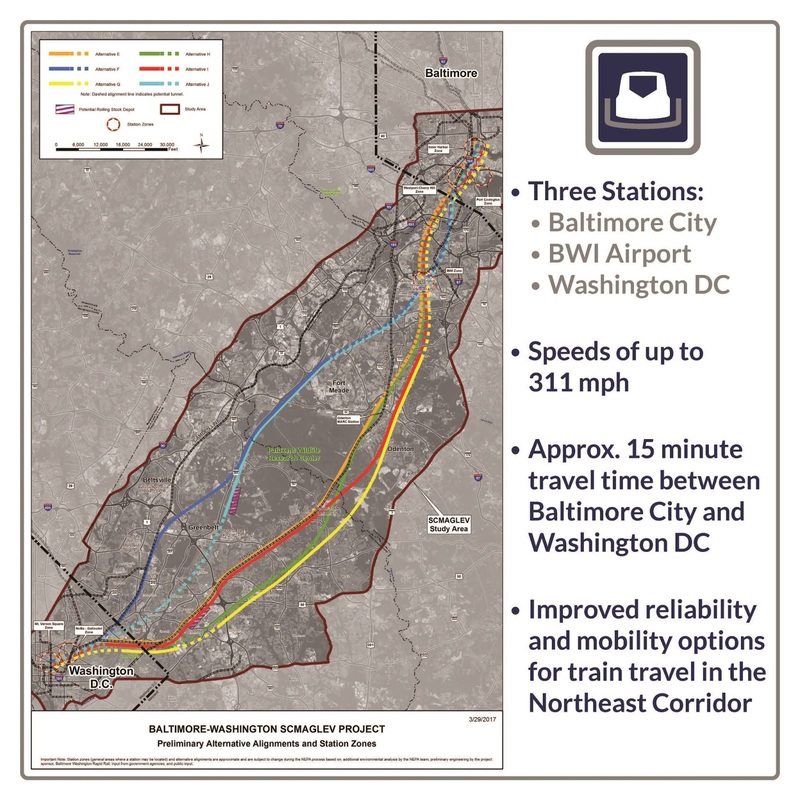 In Baltimore, by contrast new tunnels are planned as part of Amtraks NEC plans, except without a station. The originally planned new Bayview Station and also the once suggested new East Baltimore station at Broadway would make MARC a bigger part of Baltimore's urban transportation without costly new lines or tunnels. And for the proposed replacement of the ancient B&P tunnel, MARC could relatively easily include a station at Penn and North as an underground intermodal transfer to the already Metro station there. This would be especially important, since the area is still waiting for a convincing response to the 2015 unrest and because MARC doesn't connect to Baltimore's Metro anywhere. Both, a station at Broadway and a Penn/North station would provide such intermodal connectivity. With six stations in the city (Bayview, East Baltimore, Penn Station, Penn North, West Baltimore and Camden) MARC would be a viable means of rail transit in the city with Halethorpe and Martins Airport providing access to the county. In spite of all the engine and coach replacement, MARC doesn't have cutting edge rolling stock. In the long run it doesn't make sense that MARC operates with diesel engines on an electrified line, when everyone tries to electrify transportation. The reason that Amtrak charges exorbitant electricity fees must be resolved politically, even modern diesel-electric engines aren't clean enough, especially when they idle for hours in the heart of the city. Suburban trains in Europe are self propelled electric trains, many of them sleek bi-level coaches with wide doors and level boarding for quick getting in and out, a far cry from MARC trains and their narrow manually operated doors and steep steps at stations without high platforms. Many valuable minutes could be shaved off from the run-times to DC if trains could load and accelerate faster. With additional trains running, express trains which don't stop everywhere could achieve even higher speeds and further reduce trip times. Of course, it also doesn't make sense that MARC trains are maintained in Amtrak facilities allowing Amtrak to hold MTA over the barrel everytime a maintenance contract expires. The fact that the CTP has eliminated further work on MTA's own MARC maintenance facility doesn't bode well for an attempt to run the system with less dependence from Amtrak and CSX. All in all, MARC must become much more like a cross between Metro and Acela and be much less like an old fashioned railroad. This would require to run MARC more like NJ Transit, with some own tracks, their own rolling stock and their own operations management. Such as system could be a huge boost for Baltimore and do a lot to tie the mega statistical area of DC and Baltimore closer together. MARC as the spine for regional smart growth was for a short time a vision discussed in the context of BRAC, the base realignment concept that brought so many additional jobs to Maryland. The idea is still viable. 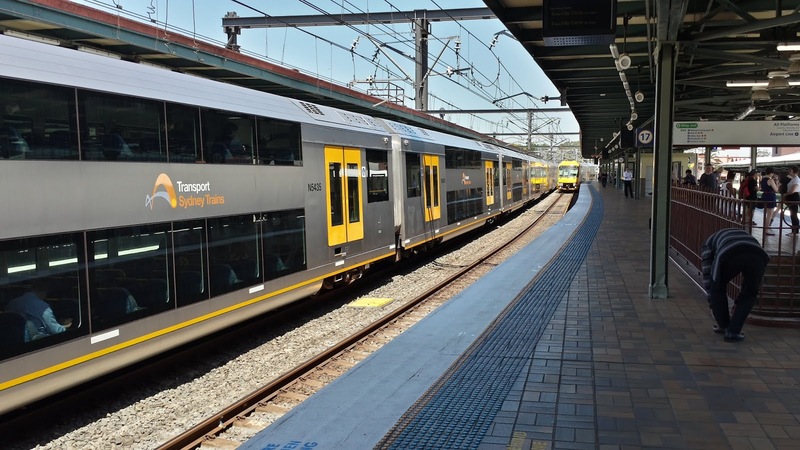 It is the first thing that should go into the new regional rail plan as a relatively low hanging fruit. Can Maglev trains make the US a leader in high speed rail? In the context of the wide outreach to politicians and the media by the Japanese rail consortium to promote their magnetic levitation train system (Maglev) for use in the US, the Baltimore SUN was in Japan to test the trains and investigate the topic in detail. The first route is supposed to run between Washington and Baltimore. The Sun covered its findings in a detailed and largely impartial report which covered three and a half pages in its print section. However, the author of this article believes that many relevant questions were not asked. This article is intended to put them on the table. 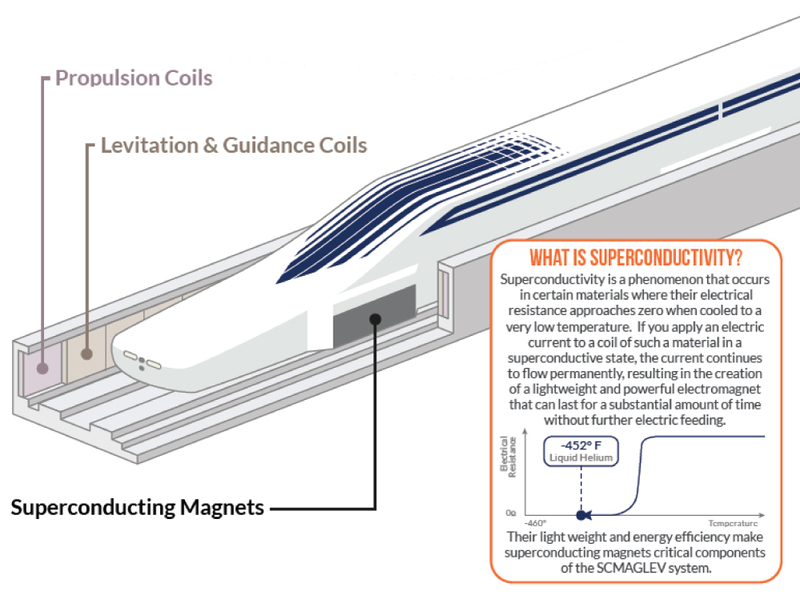 When it comes to magnetic levitation trains proponents stress the superlatives: The speed (311 miles per hour), the fact it can't derail, the precision (0.5-3.7"), the cost ($10-15 billion for 30 miles between DC and Baltimore), and the technology itself. Comparisons usually reach beyond the earth: There is inevitable talk about Kennedy's challenge to put a man on the moon. Comparisons are also made to earlier technological revolutions: How those who funded and built the first US passenger railroad (starting in Baltimore) outmaneuvered those who continued building canals. How the automobile was not just an improved horse carriage. How adopting the Japanese technology would somehow move the US to the front of high speed train technology. Today "disruption" has become the mantra for entire industries and the inventor Elon Musk sends a Tesla into orbit, the promoters of Maglev trying to direct some of this glow on their trains which still haven't really caught on. The technology is, indeed, a superlative and some basics are needed to understand what chances Maglev has to be a disrupter in transportation. The key technological difference: Unlike conventional trains, there isn't an engine or a set of electric motors pulling the train along steel tracks but electricity is used to create magnetism between the guideway and the train which makes it float and move. 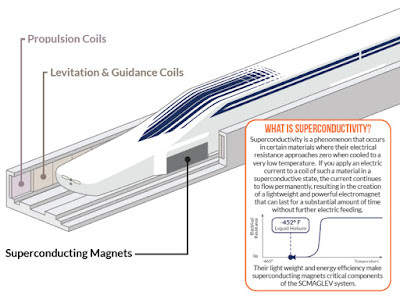 While traditional electric motors have a coil, in the "linear motor" of Maglev the coil is unspooled along the guideway. Maglev is not a new technology. It has inspired the fantasy of engineers and politicians for a at least a century. The idea to use it for a new generation of trains is least 50 years old. In spite of all that time, only two Maglev test tracks were built (one in Germany, one in Japan). Only one short spur of the German system has ever gone into service for revenue: The Shanghai airport line. The Japanese finally have a longer route under construction. 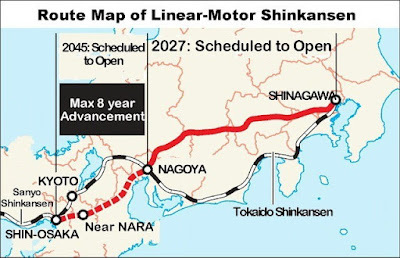 It will connect Tokyo to Nagoya and is planned to open in 2027 for an estimated cost of $80 billion. A later extension is planned to go to Osaka. The Japanese system uses cooled superconductors for the massive amounts of electric energy needed to charge the magnets and create the levitation and propulsion. This reduces electrical resistance and saves some energy, but is in itself a feat of technology since it requires cooling the magnets to -480F, not something a regular refrigerator can do. There are several reasons why Maglev has not become the prevailing technology for high speed trains anywhere and why China builds an entire high speed rail (HSR) network with conventional steel wheels on steel rails and not with Maglev, no matter how much magic the patent holders attribute to this particular disruption. The reasons are technical, economical, environmental and most importantly, reside at the most relevant question in transportation, its purpose and need. In critical reporting about Maglev the media enlist the standard environmental issues of displacement of people, vibration, noise and impacts from tunnel construction. This gives the impression that Maglev would be the victim of the usual NIMBY arguments leveraged against any other transportation project as well. From what is public knowledge, the environmental impacts of Maglev would not be higher than with conventional rail. The higher speed won't lead to more vibration and noise because the air cushion eliminates the biggest source of noise and vibration: Friction. Tunnels and bridges will be constructed the same way as in conventional rail. At grade service problematic for anything that moves near or above 300mph which makes any version of surface rail more disruptive than traditional railroads allowing at grade crossings and the like. More problematic is the technology itself. It requires extensive guideway construction and high amounts of electricity. When innovators talk about disruption, they also talk about scale. Without scale Maglev can't be a true disrupter. Scale occurs when after initial pilots a new technology becomes cheaper and inevitable because of mass application. That has happened to computers, solar cells and mobile phones. There is no hope that Maglev could embark on such a path. The 50th Maglev would be just as expensive as the first, its energy consumption no less. 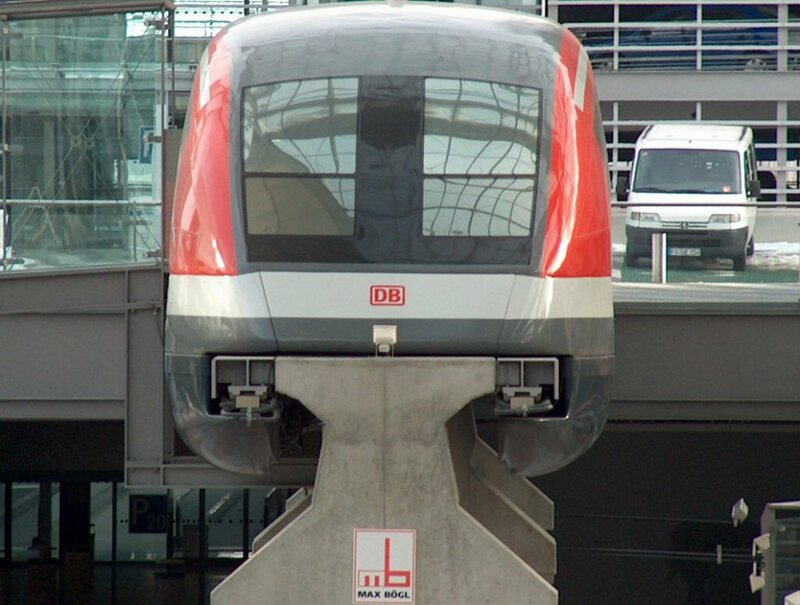 Unlike semi-conductors, Maglev trains are a full and complete system and as such don't allow incremental improvement. If new ways of doing magnetic levitation or propulsion would be developed, it would make the current system obsolete. 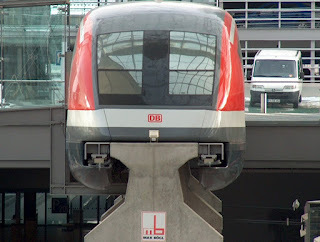 Just as the German and the Japanese system are not interchangeable, Maglev technology is highly proprietary and unique. So much so, that it is incompatible with every single other mode of transportation in use today. This is no small problem. In fact, it is probably the reason why no country has implemented Maglev as a system. The unique linear motor induction technology raises even the question whether Maglev is connectable with itself with switches and a network of guideways as in a traditional rail network. The comparison with conventional rail highlights the network question very well: Conventional rail is by and large compatible from country to country and even between different modes such as streetcars, light rail, commuter rail and high speed rail. This not only allows light rail or commuter trains to travel on the same tracks as Amtrak trains, but it also allows trains to cross borders to Canada or, in Europe across many countries. Operation and technology commonalities allows also incremental improvement and many different types of engines, coaches and train sets to operate in a mix. Europe, Japan, and recently China have high speed trains in operation, which can reach speeds very close to those of a Maglev train. The French train a grande vitesse (TGV) may not excite engineers as much as a super-conduction Maglev train, but it operates every day on a large network with speeds of 199 mph and in can roll into the same train station next to a slow commuter train. In a time when there is a lot of talk about resilience, vulnerable systems are questionable. High speed systems of any kind are far more vulnerable than traditional trains but Maglev poses its own set of vulnerability. Dependence on one single manufacturer and its patent is a huge vulnerability. The fact that Maglev trains can't derail, can't collide with each other (at least not on the same track) and may be thus safer than conventional trains doesn't eliminate its vulnerability as a monopoly. There are other vulnerabilities: If the power goes out on a conventional electric train, a diesel engine can be dispatched to push it to its destination. Maglev has no such option. In fact, on traditional tracks almost anything can be dispatched, including construction equipment, cranes and emergency vehicles provided from a wide market of sources. For Maglev all of this would have to be sourced from the single manufacturer. The Maglev guideways are unique and much more complicated to build than steel rails on ties on rock ballast, or even than steel rails mounted on continuous concrete slabs. While it is true, that conventional high speed rail puts enormous stress and wear on tracks and wheels, these items can be calibrated and maintained on a daily basis without too much difficulty and cost. Maglev guideways have much less wear due to the lack of direct contact, yet, they cannot be easily calibrated either. Besides, the Japanese Maglev trains still have contact wheels for low speeds up to 70mph. Meanwhile the Japanese u-shaped concrete trough poses drainage, ice and snow challenges. Like any big concrete structure it has all the well known problems of tolerances, concrete fatigue, cracking, corrosion and deterioration from stray current, issues that plague bridge engineers around the world even without those super high speeds. It is actually only consistent that Elon Musk's Hyperloop, also proposed for the DC to Baltimore connection, is in many ways more innovative by addressing those problems. It deals with air drag which grows in square to the speed by suggesting a vacuum tube. He eliminates much of the concrete guideway through his efficient tube construction and he replaces a continuous linear motor propulsion system with intermittent boosters. His entire system would be underground and never be exposed to the elements. His tunnels and passenger compartments are smaller and allow customization of origins and destinations. Of course, his system is even more conceptual than Maglev. The matter of customization gets us to the most important point, the transportation purpose. Maglev proponents promise to take a bite out of congestion and air pollution and getting people faster to where they want to go, all items which score under what transportation experts call "purpose and need". There is no doubt that the Northeast corridor is congested, whether one talks about roads, airports, or even trains. Could Maglev really make a difference? No doubt, many people cherish train travel over flying or driving because of its superior experience which includes seeing the landscape, being able to eat a real meal on the train or to walk around. Amtrak already beats air travel within the Northeast corridor in passenger volume and is already the only corridor in the country where the train is faster than the car. Anybody who ever planned transit or transportation knows, that the users have totally different concerns than engineers and operators. Take station frequency. Today, the Northeast corridor between Boston and DC is Amtrak's most traveled corridor. It accommodates fast and slow trains and occasionally even a freight train. While this may bother operators and engineers who tend to look at speed, it allows a seamless system in which users can easily move from one type of train to another on the same corridor. Stations slow trains down, but the nicest train is useless if there is no nearby station. The fact that intercity, regional and local trains all move within the same corridor and network gives almost anybody in the corridor access. This may sound trivial, but consider the proposed Maglev between Washington and Baltimore. It is supposed to stop only once, at BWI airport, and even that one stop is one too many on a 310 mph ride over a 30 miles distance. As any rider on the current commuter trains knows, the bulk of riders on the way to DC don't use Amtrak but the local commuter train which allows them to board downtown but also on the many stops in between. If the Amtrak Acela doesn't stop at the Newark airport, it is easy to take a local train from the city to the nearby airport stop. A big issue is cost. A full price ride on the commuter train from DC to Baltimore cost $8 each way. A trip on Maglev is estimated to be set at what Amtrak's Acela train costs today, anywhere between $50-$100 for the same 30 miles that cost $8 on the commuter train, clearly not an option for the masses. Thus, Maglev fails on being able to attract masses because of geography and cost. In other words, it fails to meet two of the critical transportation needs. There are more psychological arguments as well. It has become popular to say that "it is not about the destination, but about the journey". While this isn't typically applied to transportation (where it usually is all about the destination), there are certainly current lifestyle trends towards optimizing experience in just about anything we do. Thus slow food or a local coffee shop are brought into position against fast food chains or diner coffee. The experience of travel in trains belongs in this category. Once a train shoots like a bullet through or under the landscape the journey feels more like a ride on a subway. While this concern may sound overly esoteric, the attraction of high speed train travel in Europe has a lot to do with the fact, that it still caters to the allure that trains have always had. Maglev trains would run on a completely separate right of way and interface with the conventional train network would hit or miss. How much so shows the current environmental impact study underway fro the DC to Baltimore line. 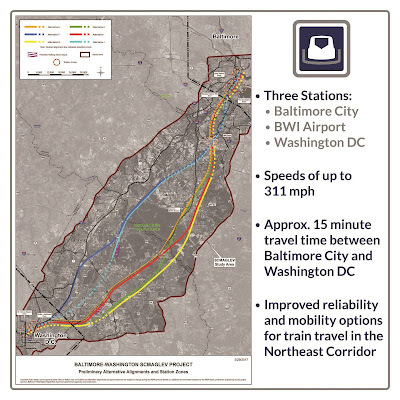 All three alignment alternatives show a Baltimore Maglev station on the southern periphery of town, far away from Amtrak's Penn Station near downtown. 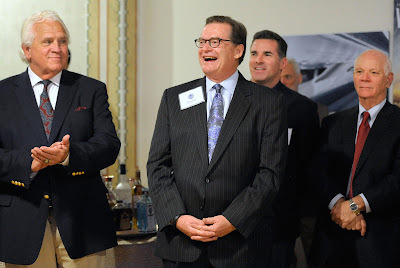 When I asked the Maglev study engineers at a recent open house, how the Maglev alignment would eventually continue north towards New York or how people arriving at the suggested Westport or Port Covington termini are supposed to continue their journey, they shrugged their shoulders and admitted that this was a good question. None of the exhibited materials broached this question and to this day I still haven't received an answer, even though I submitted it in writing. The only option today would be light rail or a bus: travel time around 30 minutes, minimum, about twice the time the entire Maglev trip was supposed to take. 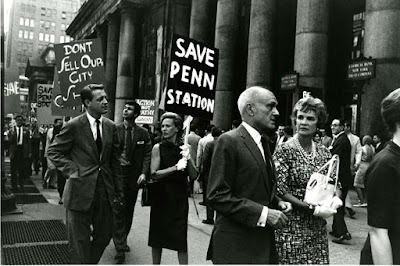 By the time those Maglev travelers would finally reach Penn Station to continue their journey to Philly or NYC, the Acela traveler starting in DC at the same time would already see the outskirts of Wilmington, DE coming into view. Acela current travels maximally $150 mph, on some segments it has to slow to 30mph. With the billions needed to build even just the first leg of Maglev, the worst bottlenecks could be eliminated on the entire Amtrak Northeast Corridor (NEC) for better HSR. A better deal for all. Maglev: "Boondoggle always in the back of my mind"
Baltimore AIA tops out their annual event schedule with a Design Awards gala in which good architecture is celebrated through design awards, whether the buildings are designed by local architects and built here or elsewhere, or whether local buildings are designed by architects from elsewhere. 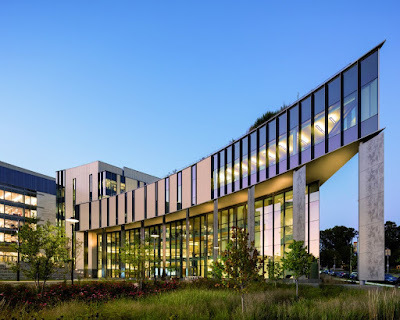 The new Morgan Earl Graves Business School received the Grand Award. The BBJ expanded the discussion to the overall status of Morgan in an article titled "More than 'just an HBCU': How Morgan State is transforming its campus and its academics" published this Friday. AIA Baltimore and the Baltimore Architecture Foundation honored the best of Baltimore-based design at the 2018 AIA Baltimore Excellence in Design Awards Celebration hosted at Center Stage on October 19. When a Baltimore University spends $80 million to build a 138,000sf facility for 1,500 students one should take notice, especially when the building sits on a new addition to the campus, is highly visible from one of Baltimore’s arteries and has been designed by the high profile team of Baltimore based Ayers Saint Gross Architects and Kohn Pederson Fox headquartered in New York City, known for signature architecture around the world. What was rising along Hillen Parkway, across from Morgan University’s main campus, looked extremely promising, when the structure with the sharp bow was just a steel skeleton. 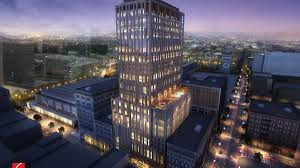 But when finished last year, it did not place Baltimore on the map with an instantly recognizable architectural landmark. Certainly a notable building, it nevertheless did not set a new standard or shake this city out of its conservative preferences. The let-down comes in part from the fact that the daring shapes are clad in those all-too-frequent timid beige tones, in a misguided attempt to blend in. From a distance, the result is creamy mush. The daring pointed confluence of the concave façade along Argonne Drive, intersecting with the straight one along Hillen Road, is really dramatic close up, but gets lost when seen from only a block away. 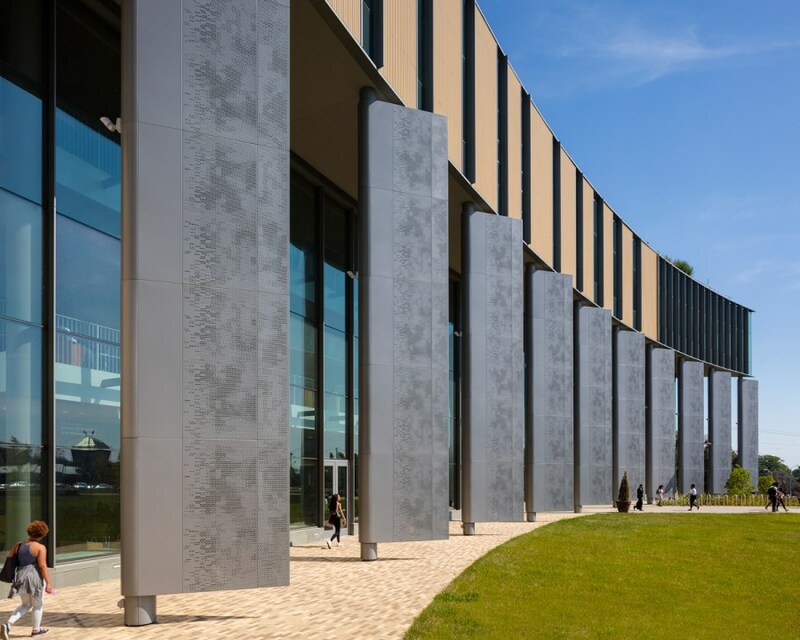 Not only do the shapes visually merge for their too similar colors, but the volume of the pointed shape is too light and skimpy for the lofty height it reaches due to the rapidly sloping terrain; too jacked up, the cheap metal clad façade becomes one with the sixth floor much further back, clad in matching stone panels with the same vertical slot windows. 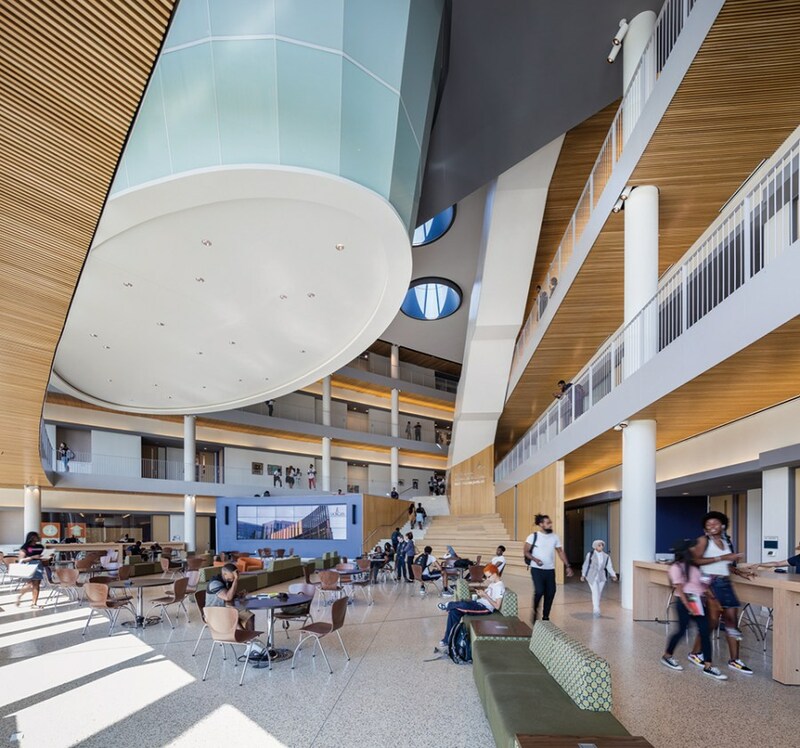 This new building, the Earl Graves School of Business, occupies a triangular footprint whose volume is largely hollowed out in favor of an awe-inspiring and pleasant, but very space consuming, atrium. A suspended trading floor hovers over the commons like a spaceship with an ominous dark eye peering into the space, more a symbol of the power of markets than of welcoming architecture. The interior connectivity makes milling around, exploring the building by criss-crossing the atrium in various directions and discovering the learning spaces, an uplifting experience. There are great lecture halls, well appointed seminar rooms, and plenty of comfortable gathering spaces carved out circulation space. The building is best where it consists mostly of glass and steel on its southwest point. The access to the front door under the tall portico flanked by the row of airplane wing shaped columns is very powerful. 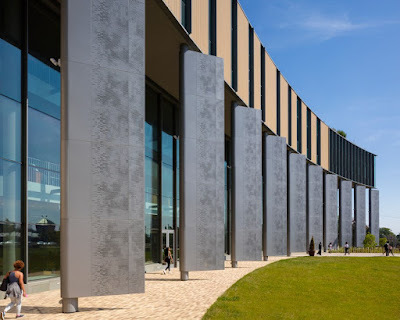 With different colors for the steel siding and the stone panel siding, Morgan’s School of Business building could be as exuberant as KPF’s very similar business school in Tempe. Together the new Jenkins School for Behavioral Science designed by HOK architects, which is now complete just west of the Earl Graves Business School,the two structures boldly claim and define the new Morgan West Campus, proving the university’s commitment to architecture. 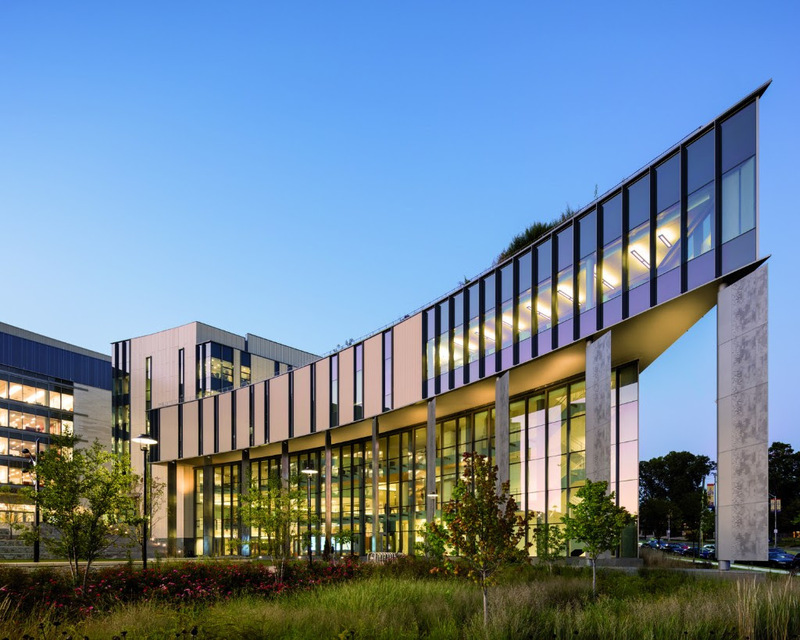 Some even say they wished that the architecture department would have a building as expressive as the business school. The AIA website also includes a list of other award winners. The review was modified for the Wilson quote and in the last paragraph to reflect the current state. Has the SUN gone mad to endorse Hogan? 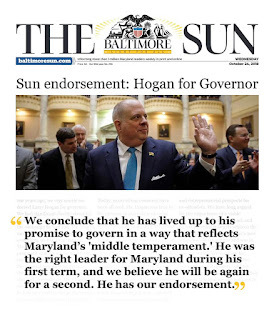 Die-hard Republicans who have seen the Baltimore SUN as nothing but a liberal rag out to bash the Maryland Governor and the country's President at every turn may well have heart palpitations when they open their paper on Wednesday and see the SUN endorse Larry Hogan for Governor. A chorus of "wow" must have sounded out all across all those breakfast tables which are still graced by a printed newspaper. Liberals are aghast, even though (or because) the paper's endorsement is very tortured just as a similar endorsement by the Washington Post was on Oct. 10. In fact, the two editorial boards large make the same twisted and have it both ways arguments. 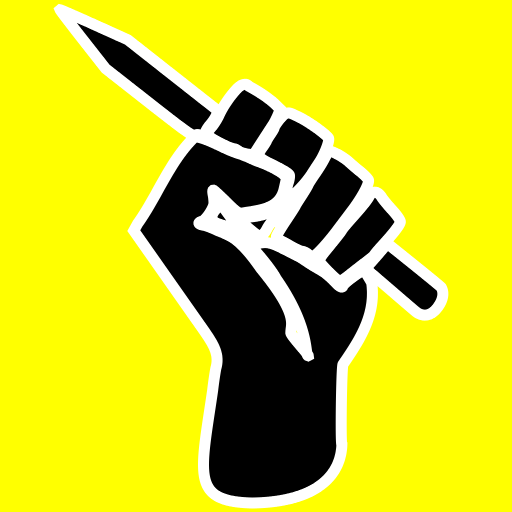 This blog tries very hard to stay away from party politics and from assessing the state of urban affairs from the perspective of the personalities who shape them, even though personalizing politics and policies has become a favorite game not only in the many online forums in which anybody can write anything about anybody but also in the the traditional media. But the SUN endorsement is something that touches on too many issues to be ignored. First, this is the "Baltimore SUN" and not, say the "Maryland Mirror". It says so right in the masthead! One would imagine that as such the paper would recommend the candidate best for Baltimore City or the core region, not the one best for the poultry farmer or suburban developers in Cecil County. But papers are in decline and as such, they apparently must bend to less principled positions. And then there is that entire complex of personality politics over policies which apparently makes Larry Hogan the more likable candidate, a matter that shouldn't be the base of the contest. Finally, there is the decline of traditional parties, a phenomenon not only in the US but more so in parliamentarian democracies elsewhere. 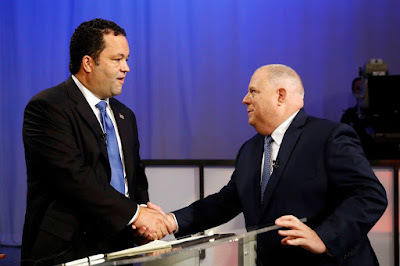 A Republican governor candidate being popular in a blue state isn't an anomaly, nor is it unique to Maryland or a sign of schizophrenia. The same thing currently plays out in blue Massachusetts. 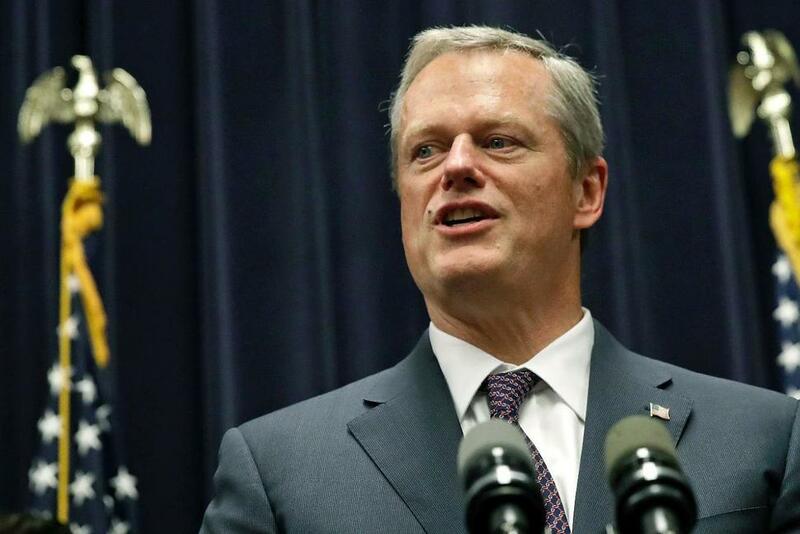 There incumbent Governor Charlie Baker beats Larry Hogan with the nation's highest approval rating of 70% in a state that has only 10% of voters are registered Republican. A Republican governor in a mostly Democratic state has to contend with two chambers of representatives that have the majority, naturally must moderate his party's positions or would never succeed in anything. To what extent such moderation is a reflection of genuine moderate positions is sometimes hard to determine. Certainly, voters like to see non partisan politics and detest politicians who seem to march to a party program. Voters today seem less ideological, more pragmatic and not interested in past party allegiances. This isn't limited to Maryland or the US but plays out in Italy, Austria, Germany and England, often with the result that populists determine the agenda. The US with its winner takes all system which really allows only the two major parties to play, this new voter orientation is hard to accommodate. Popularity by politicians who don't sing off a party sheet appears to be a result, Baker and Hogan are examples, and in a different way, also Trump. Much less hard to determine is what Governor Hogan's decisions have done to Baltimore. True, he ran a campaign in which he was critical of almost anything Governor O'Malley had done or supported, regardless who had initiated it. In that vein, Hogan has campaigned both against the Red Line and he has also campaigned against the State Center revitalization project, in both cases with claims which are largely unsupportable. This is not the space to litigate the details of the claims and counter-claims, except to say that taking a combined sum of about $5 billion off the table in a city like Baltimore makes a difference. The money that both projects would have brought to a city reeling from so much inequity and segregation that it erupted into civil unrest in 2015 would have created jobs, taxes, social capital and better access to services and jobs. The one would have been a vital piece of new infrastructure, the other a vital piece of optimal utilization of existing infrastructure. Critics of the Red Line or of State Center must admit, that no equivalent projects were offered as a substitute; the money just disappeared with a big sucking sound and there isn't anything in the pipeline that would bring an even remotely similar economic boost. It is hard to not take this simple economic fact as anything else as active disregard for the city. The Governor had four years to re-negotiate the terms of the State Center contract, but the truth his, he never once even met with the development team and his talk about alternative schemes consist of nothing but smoke and mirrors. 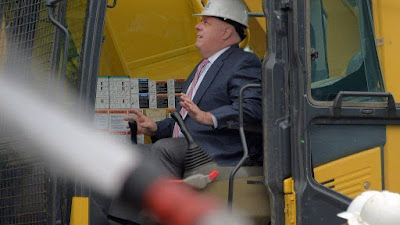 Similarly, the rejection of $900 million federal funds for a transit project that had broad bi-partisan support from the start in 2002 was never underpinned with any type of analysis that supported any of the blatantly false assertions Hogan made, especially about the suggested transit tunnels and their cost estimates. Small grants and funds for a few extra buses, a small transit center, some bike stations, some more police, teachers or schools cannot make up for those lost billions, no matter the many photo opps they create for the Governor to declare his love of the city which in spite of everything is still the largest economic engine in Maryland. Ok, people maybe tired to keep hearing about State Center and the Red Line by now and may be tempted to say, like the SUN, that otherwise the Governor was really good, wasn't he? The reality is, that Governor Hogan practices populist politics that are frequently based on similar principles as those in Washington. True, his environmental agenda could have been much worse (he supported a ban on fracking) and his incarceration reduction program was successful. His efforts towards a non-partisan redistricting commission are the only way forward and his opponent's comments on that topic are inexcusable. But big red flags galore: For example his talk about the "rain tax" and that Democrats are just "tax and spend politicians". Decrying a funding stream that is directly based on run-off, the very thing that flooded Ellicott City, degrades streams and creeks all around Maryland, is just one example of this unfortunate populism. Fixing run-off, water and sewer systems are enormous expenses that cannot be funded without those funds and without disincentivizing run-off. Or the States fund for demolition of Baltimore rowhouses (Project CORE): Hogan regularly touts those funds as special aid to the city, even though the total funding includes programs that were in place long before the Governor took office, and even though his additional funds are heavily slated towards demolition not new construction or rehabilitation, the true economic drivers. This caters to a simple populist approach common among suburban voters that one should "take down large parts of Baltimore and put a fence around it and call it a day". There is no doubt that project CORE has funded many good smaller projects, but one would be hard pressed to call it an adequate response to the unrest of 2015 of one of the richest States in the nation. 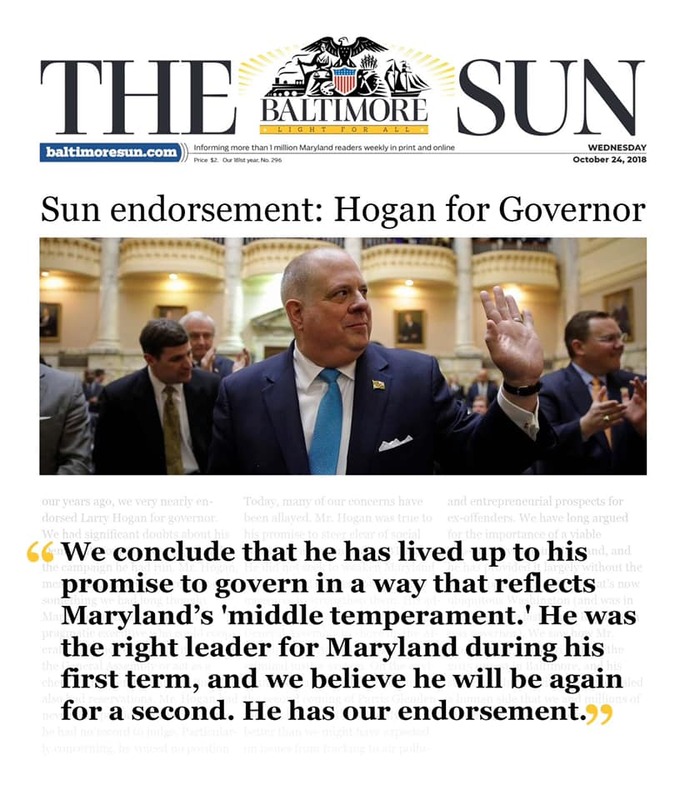 The SUN editorial finds praise for Hogan sending the National Guard in 2015, but fact is, that to this day Baltimore cannot point to any single thing that could be considered a response commensurate to the problem this city has with population loss, violence and economic and racial segregation. The Mayor, seeking to be on the governor's good side has repeatedly received his cold shoulder instead, with heaps of thinly veiled derision. In the case of crime, this is not fair, given that Baltimore police is at its root a State agency. The biggest populist ruse, though, is transportation. As I have pointed out in many articles in this space, building additional beltway and Interstate lanes may be popular, it is a deeply flawed approach to CO2 reduction, to safety, to smart growth and even to mobility itself. Federal transportation bills ever since President George Bush senior require a balance between roads and transit and require consideration of land use. Hogans transportation plans have no balance whatsoever. If he points to transit expenditures, he points to measures such as the fleet replacement of subway cars or the overhaul of tracks and trains at light rail which had been in the budget before he came into office and which he couldn't avoid. A bill that would require the State to score its transportation projects for merit was fought tooth and nail by the Governor. In the end and after a veto and re-write of the bill, though, the State implemented a fairly decent system of metrics to measure projects, none of them stopping the incessant highway widenings, though. 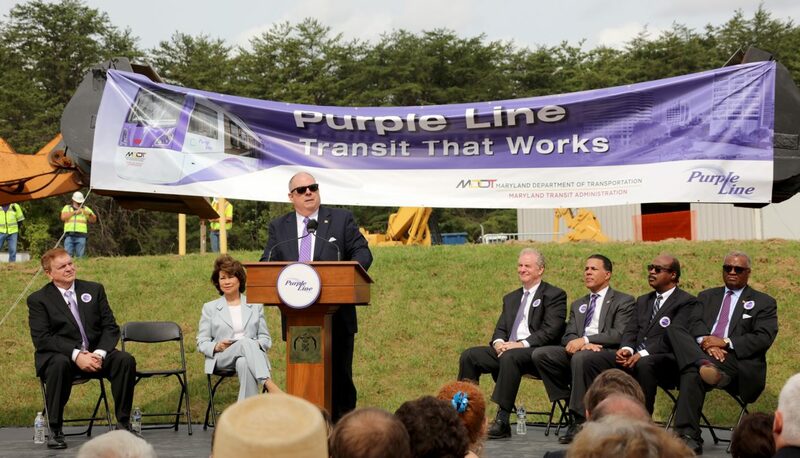 The Governor likes to point to the Washington area Purple Line as proof, that he likes transit, but at the same time he slashed the State's share to a minimum and let private companies take over, a strategy that exploded the full cost of the project from $2.6 billion to $5.6 billion even after the initial construction cost was value engineered with the kind of measures that could also have been applied to the Red Line. The difference is that those large amounts will become due long after he will have left office (Private partners will charge the State for 35 years). Both, the State's failure to fund Baltimore in a big meaningful way and to develop a future proof forward looking transportation policy is ultimately not just a failure on a constituency which admittedly generally didn't vote for this governor but a failure on the the State in general. 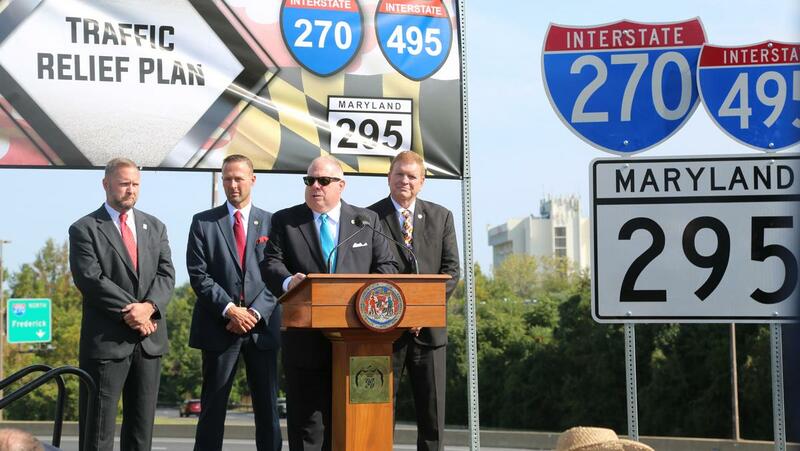 While a majority seems to be happy with the current proceedings of threading water and not making any waves, Maryland cannot succeed in the long run without its biggest and most important center thriving and without a response to mobility and access which has a repertoire beyond 1950s road construction. In that, the SUN editorial is just as shortsighted as the candidate's agenda. 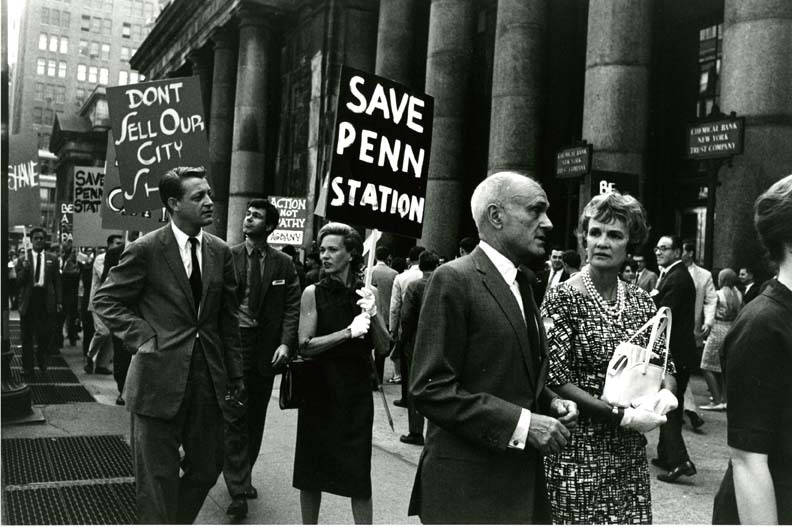 Awareness of the value of historic preservation for urban design, economic development and the authenticity of cities has dramatically increased since the days when New York City thought nothing of demolishing its beautiful Pennsylvania railroad station. The Baltimore jail, dating back to the Civil War era, is a difficult case for anyone who cares about historic preservation. 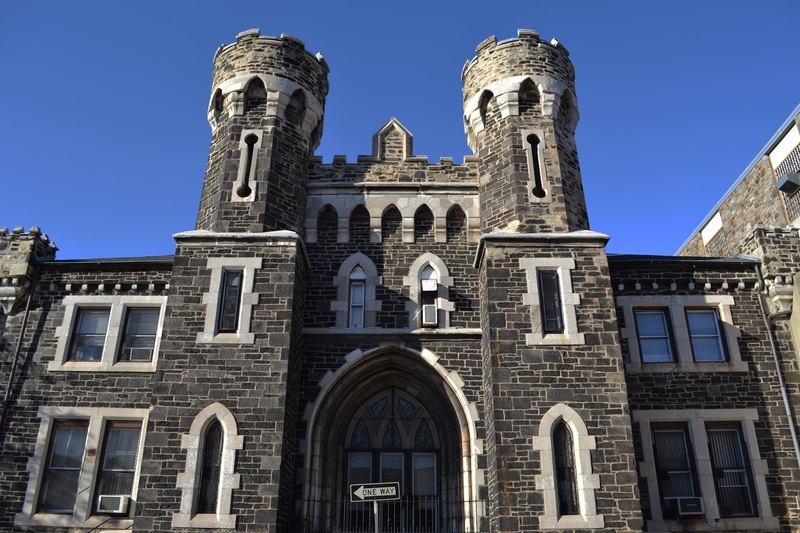 The historic complex is partially still in use and is a manifestation of many of the ills of the American correctional system. Deficiencies in the complex are so rampant that the complex is subject of a lawsuit for violation of human rights in 1971, with various settlements and improvements made since then until Governor Hogan announced a shut-down in 2015. The State took the facility over on request of the City in 1991. The Maryland Department of Public Safety and Corrections Services (DPSCS) is proposing demolition at the Baltimore Correctional Complex in Baltimore City in order to construct a new, state-of-the-art, code compliant facility that meets 21st Century Conditions of Confinement for inmates. The project is needed to respond to the ongoing Federal judicial review and 1993 Consent Decree citing the unhealthy environment, inadequate facilities, and privacy issues at the Baltimore City Detention Center. 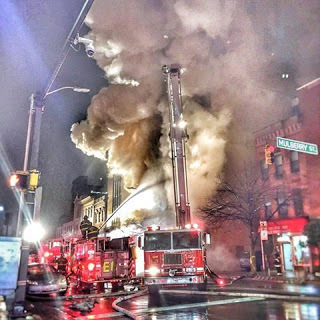 Pursuant to Maryland Historical Trust Act of 1985 Section 5A-325 and 5A-326, commonly referred to as Section 106, DPSCS initiated Section 106 with the Maryland Historical Trust (MHT) on January 29, 2018 and submitted Determinations of Eligibilities (DOEs) on the Baltimore City Jail and Maryland Penitentiary on May 18, 2018; both DOEs can be accessed via this link. MHT concurred with the findings and DPSCS held the First Consulting Party Meeting on July 25, 2018 and presented the determinations from the DOE documentation, identified the project scope, outlined a draft Area of Potential Effect (APE), and identified historic resources within the APE. 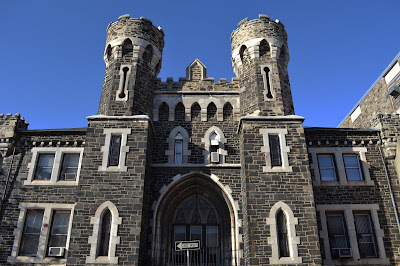 Barring immediate and strong actions of community groups in the vicinity of the prison or by preservation activists the unique granite structures of the historic prison complex will be demolished without a proper vetting of alternatives and without a proper public involvement process, both are requirements before historic resources can be eliminated. The jail sits at a critical seam in the middle of Baltimore. It contributes to the isolation of eats-side neighborhoods; the large complex has long been identified as instrumental for the revitalization of the east side of Baltimore. The swift and largely stealth demolition plans (bids for demolition contracts are already being prepared), are not acceptable, not from a city planning perspective and much less nor from a historic preservation and not from a due process point of view. Erected in 1901 in the Renaissance Revival style on the west side of North Eutaw Street about 100 feet south of West Mulberry Street in central Baltimore, Maryland. The five-bay facade has large industrial plate glass vertical pivot windows flanked by Ionic and Corinthian columns. The heavy overhanging cornice has dentils, foliated modillions, and lion heads. The Roman brick side piers have medallions and lion heads below the intermediate cornice. The street level storefront is altered and consists of plate glass windows across the entire front flanked by polished granite panels at the sides. The entrance has been relocated to the north elevation. In 1986, the building was occupied by a printing service. The building was later used by The Tunnel nightclub which closed in 2002. With a rehabilitation of the Lexington Market apparently within grasp, the demolition of one of the stateliest buildings on Eutaw Street would be the worst outcome possible. Clearly, even if the owners feel unable to fully rehabilitate the building, the demolition would cost likely as much as a new roof which would stabilize the cornice and protect the remaining shell from the elements. 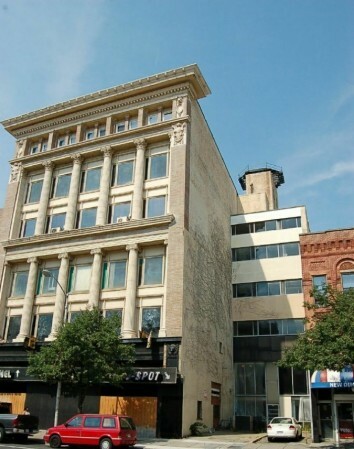 Once the building is stabilized the City should assist in finding a developer who would be willing to invest in an area with the region's best transit access. floor retail in front of the eyes of City officials in order to get his demo permits. All of Baltimore's successful conversions and adaptive reuse projects are apparently not enough to convince officials that preservation is a much better path towards economic development, proven from Boston to Detroit. No city demolishes itself to prosperity. Will the Lexington Market finally be saved?